Armenia. Hetoum I, AD 1226 to 1271. Copper Kardez. Reference : Nercessian - 359. Bed - 58. Size : 22.4 x 23.7 mm. Weight : 3.91 grams. Grade : F, a little off-center. Mid brown patina. 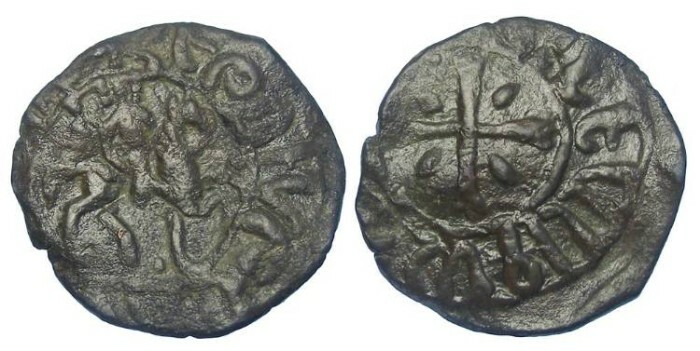 Obverse : Hetoum on horseback, with an Armenian inscription that translates as "HETOUM KING OF THE ARMENIANS". Reverse : Cross potent with egg shaped lines in the qudrants, with an Armenian inscription that translates as "STRUCK IN THE CITY OF SIS".